Electra, Eureka, Fellowship, Fruitland Park, Fairfield, Fort McCoy, Georgetown, Grand Island, Hog Valley, Lake Charles, Lady Lake, Lowell, Marion Oaks, Arlington, Atoona, Altoona, Anthony, Belleview, Citra, Citrus Springs, Candler, Cedar Creek, Chestnut Hills, Ranches, Dunnellon, Eastlake Weir, Mc Intosh, Morriston, Ocala, Ocklawaha, Oxford, Rainbow Lakes Estates, Reddick, Rolling Hills, Rolling Ranches, Silver Springs, Silver Spring shores, Salt Springs, Scramble Town, Sparr, Starkes Ferry, Summerfield, Umatilla, The Villages, Weirsdale, Westwood Acres. In this Package, We also recommend the use of Matrix automotive paint. Matrix automotive paint’s have been designed to match PPG's proven formula's with excellent flow-out properties and Classic Euro Aesthetics! They have nailed it on the head at such an affordable price! 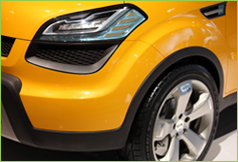 Matrix can be used for over-all paint jobs or panel painting and blending for dent and collision repairs. This package is backed by a two year warranty and will meet or exceed factory OEM standards! A 5 year or even a lifetime warranty can be granted with an upgrade to this package using our text-book method of prep work procedures. For questions or concerns about our extended warranty plan, just call or fill out our "request for information" form found on our contact us page. ​​NOTE: The prices below are based on vehicles in need of a refinish due to clearcoat peeling or complete top-coat failure, rock chips or love bug damages, deep or heavy scratches or pitting. Vehicles in need of bodywork such as large dents or collision repairs are not included in this package. However.. the use of a high build 2-K primer will be included to insure a factory OEM finish after repairing the defects listed above. ( a limited number of small dents requiring body filler may be included upon request and inspection ) For more information about this package... feel free to fill out our "request for information form" found on our contact us page. All labor and material needed for this package are included in the prices below except for the basecoat. Basecoat varies in price so drastically depending on the tints and toners within the color of choice, making it impossible to predict the price so that we can include it into the pricing below. Rest assured! Matrix basecoat's are very affordable and can be matched to factory code, plus we have a wide variety of colors to choose from. This package is a 2 Stage, Basecoat / Clearcoat Service. Our prep work for this package includes sanding the top-coat to feather failed paint edges and to remove scratches and the defects listed above. Applying the "high build 2-K primer and sanding the primer using a 2-step refining process to create a smooth and fusable surface. We remove all adequate parts and will mask off all necessary surfaces and trim. Door and trunk jambs are not included in this package. The price is $75 per jamb. We have our own facilities where we can complete the process start to finish! The full overall paint job will take 4 to 6 days to complete depending on the level of prep work involved. After the entire vehicle is complete, it will then take about 72 hours to cure enough for regular use. A “Two Year Warranty” will be granted in this Package. Call us about our extended 5 year warranty or our lifetime warranty plan! RV's / Motorcycles / Boats / Planes / Commercial Fleets… Please call for pricing. We perform minor bodywork to vehicles. 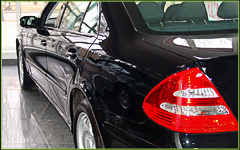 We offer extensive dent and scratch repair services. We can also refurbish and repaint most damaged bumpers. We also provide rust elimination services. However we can not guarantee 100% complete rust elimination. (Rust has an acute behavior. If applicable, extensive procedures for rust elimination can be performed with a guarantee at an additional cost). Please contact us for questions about bodywork and rust. Please see Add – On Services for spot repair prices. Gift certificates branded to the packages above will include a previously discussed price.